The Starscream clone turned retroactive G1 Decepticon Slipstream is a Takara exclusive retool of the Thrilling 30 Generations Windblade figure, the first ever fan voted Transformers figure ever made. Rather than track down Botcon exclusive repaint of Transformers Prime Starscream I opted to add this version of Slipstream to my classics collection. My first experience with the character Slipstream was as a bonus character in Transformers War for Cybertron so this incarnation of her suits my collection needs. 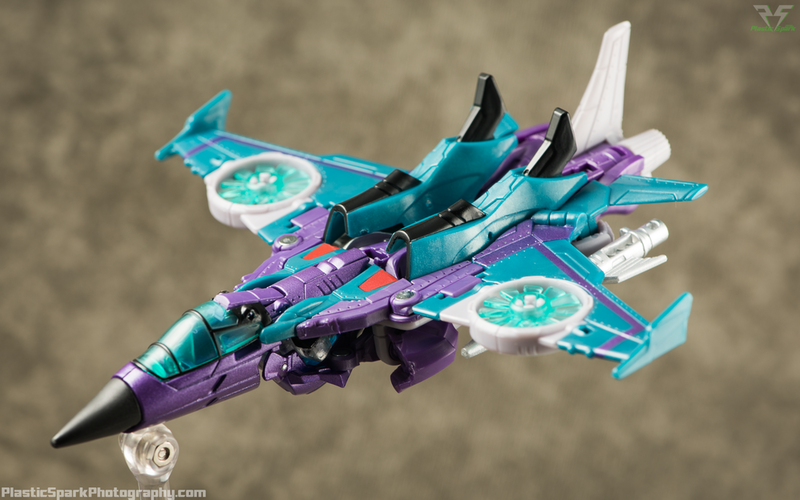 Slipstreams alt mode is unchanged from the original Windblade version of the mold but with a gorgeous teal and purple paint job that reminds me of G2 Ramjet. The mix of metallic and glossy finishes is incredible and everything about this release feels like a premium product matching the requisite price point. Slipstream comes with new Null Ray style weapons that can slide onto the fins protruding from her arms, this gives the illusion of wing mounted missiles. Robot mode is just as fantastic. The color mixture and layout is phenomenal and the new head Takara designed for this figure is gorgeous. I don't understand why they did the entire back half of the head in clear plastic, without any paint added but it is what it is. She still has the awful heel spurs that Windblade suffered with and you are likely going to spend most of your time trying to fix them while posing her. The null rays can be flipped around and clipped onto her forearms for robot mode weaponry. As long as you don't mind some of the little nuances of the Windblade mold, and you don't mind a more modern G1 style interpretation of this Transformers Animated character, Takara LG16 Slipstream is a fantastically painted, slightly above average figure. I don't feel as strongly about her as I did with Nightbird, and I don't feel like the figure is a "must have" but she is a very pretty addition to the Decepticon Seeker fleet.